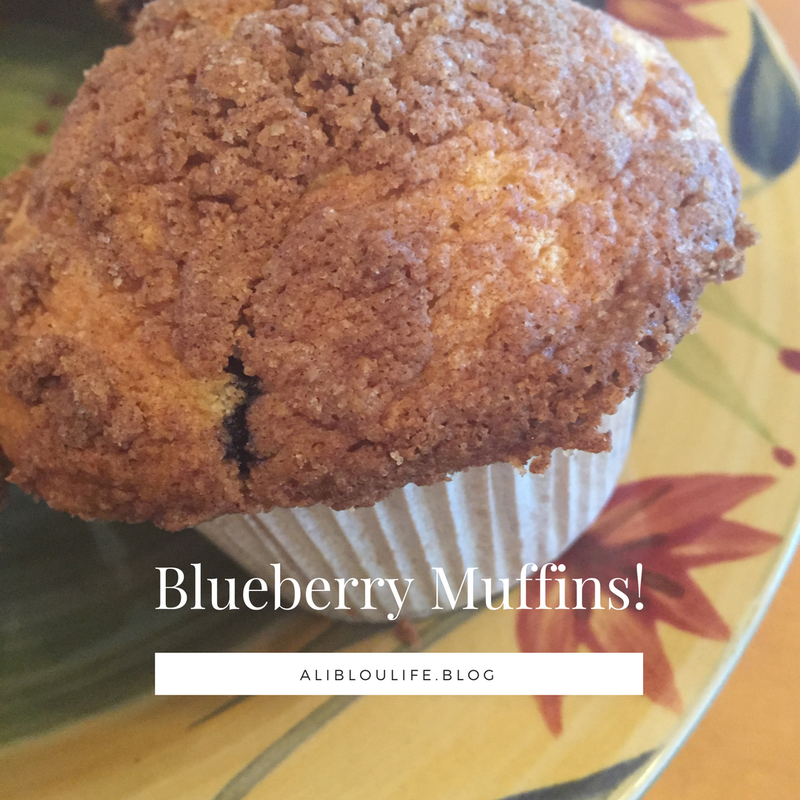 Last Summer, I wrote about this fabulous blueberry muffin recipe. Now, all you’ve got to do is add some lemon to make lemon blueberry muffins! 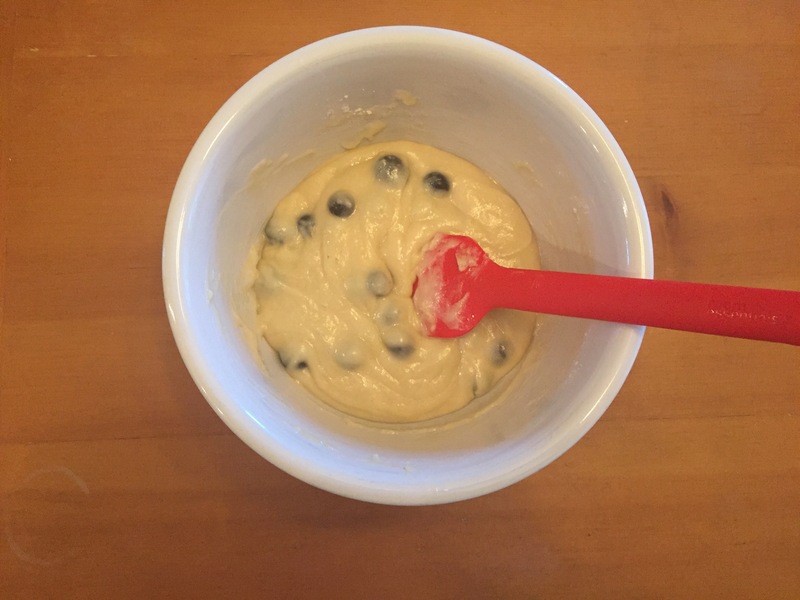 To see the blueberry muffin recipe, click here. I would suggest clicking that link before continuing because you will need a basic understanding of the recipe. To make the lemon blueberry muffins, you will need all the ingredients for the blueberry muffins, plus 1 lemon. To put the lemon in these wonderful muffins, add 3+ tablespoons of lemon juice. Now, I say 3+ because I added 3 tablespoons and could not taste the lemon at all. I’d suggest bumping it up to at least 5. I’d never baked with lemons, so add what you think is enough. Please comment the perfect amount of lemon so I know what to do next time! What I did next is put lemon zest on top of every muffin before baking. However, I realized afterwards that you should probably wait until after the muffins are cooked to put on the fresh lemon zest. I say this because the lemon zest burned and I could no longer taste it. Another idea I had was to mix together lemon juice and powdered sugar. This will make a nice glaze to put on top of the muffins and surely will add a nice zing of lemon. Add more powdered sugar to make the glaze thick, and add more lemon juice to thin it out. 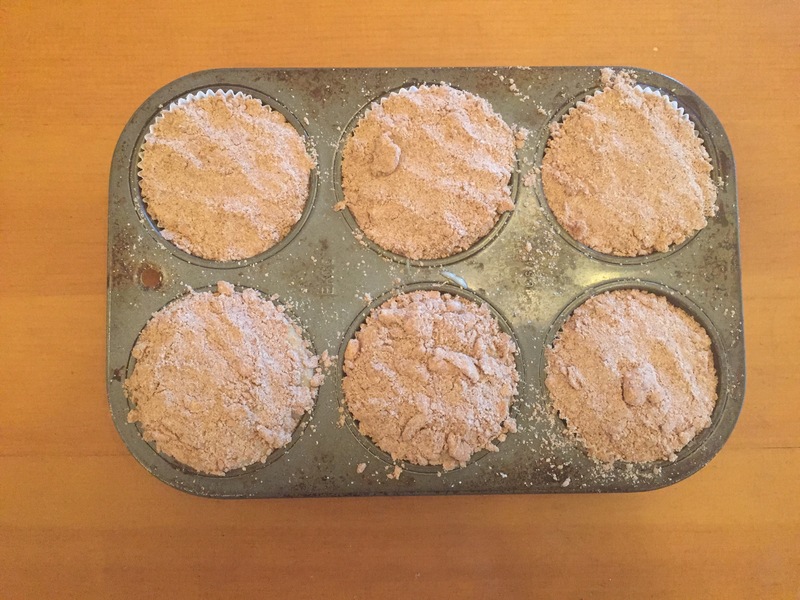 Since I was purely experimenting, there are some changes that I suggested for you to make but these muffins will turn out great! I hope you make these perfect combo muffins! Before I get into how to make this recipe, I’d like to update you on what changes I made. First, I switched from all all purpose to some all purpose and part wheat flour. Second, I used strawberries and blueberries, instead of just blueberries. It tastes absolutely delicious. Have fun experimenting with other fruits as well! The first step is to beat the butter and sugar in your stand mixer or big bowl with hand mixer, until light and fluffy. I always make sure my butter is a pale color before continuing. Next, beat in the egg and vanilla. Lastly, add in the flour and salt a little at a time. Cover your bowl and refrigerate for at least two hours. I ended up letting mine refrigerate for longer than said, and my dough was fairly hard to work with. So, when it comes time, I recommend that you microwave your dough for about 10+ seconds. However, don’t microwave for too long or the dough will be too warm, making it hard to work with it again. After 2 hours have passed, take out the dough and roll 2/3 of it into a 14 x 10 inch rectangle to fit on the bottom of a 13 x 9 inch pan. Also, pre heat the oven to 375° Fahrenheit. Rinse the blueberries and strawberries and cute the strawberries. Put the fruit, cornstarch and sugar into a saucepan. Bring to a boil and stir until the sauce thickens. Mine had some strawberry chunks and blueberries still there, that is okay. Pour the filling into the pan. You may need a spatula to spread it out evenly. With the remaining dough, cut into strips so that you can make a “lattice” pattern on top of the filling. I was not good at this, so mine does not have the fancy pattern on it. But that’s okay! You can do whatever you want to. Bake for 30-35 minutes or until the top is golden brown. Let cool before you cut and serve. And ta-da!! You are done. This treat is super delicious and would taste even better a la mode. Enjoy!! For Father’s Day this year, my family decided we would make dinner for my dad. The theme ended up being Italian. Of course, the first dessert to pop into mind is Tiramisu. Usually, I don’t like this dessert, but this year, it was phenomenal! To begin, I would like to link the recipe I used. To find this recipe, click here. On this website, the post includes tips & tricks on how to make this amazing Tiramisu. The only tip I have is to be prepared for each step. This recipe moves along fairly quickly, so make sure you have all of your ingredients out. 🙂 Now, the part we all look forward to, the pictures! This is after I dipped the last fingers into the coffee mixture. This is the “filling” that goes on top of the ladyfingers. These are pictures of the final result & it was delicious. This recipe is slightly challenging but is worth it. On Mother’s Day, we invited family over to our house for a lunch. I was put in charge of dessert and eventually landed upon this easy fruit tart recipe. I figured this would be a good idea because it would be a nice, healthy, refreshing choice. For the tart I used an easy recipe. It said for you to buy a pre made crust but I decided to make one of my own. However, I cannot find the recipe for that crust. Sorry 😦 . On top of my filling, I put blueberries and strawberries, but you can use whatever you like. Now, I did have to double the recipe for the filling so that it would fill my pie pan. The one tip I can give is when the eggs are heating in the sauce pan, keep watch. You do not want lumps. To see the recipe for our tart click here. After following the recipe, the tart turned out spectacular! It was pretty and tasty. One of my all-time favorite treats is a Ferrero Rocher. These bites of heavenly goodness make me scream with joy. Why not make them into a cupcake? The cake recipe I used is actually one I have talked of in a previous post. I used the recipe for almond flour cupcakes, except I used all purpose flour and made some other slight modifications. To check out that previous post, click here. That link includes the recipe and directions, but I am going to talk about that here as well because it is slightly different. Crushed hazelnuts to roll the cupcakes in at the end. First, pre-heat your oven to 350 degrees Fahrenheit or 200 degrees Celcius. Line a cupcake tin and spray the inside of each liner with some non-stick cooking spray. Then add your softened butter into a mixer along with the sugar. Beat for at least a minute or until light and fluffy. Next, add in 3 eggs and beat until smooth. I added mine one at a time blending for about 15 seconds after each addition, and an extra minute after all the eggs are added. Lastly, add in the flour 1/4 a cup at a time, blending well after each addition. Add in the vanilla and you are all done! This recipe is super easy and does not take long at all. I used an ice cream scoop to put the batter into each liner. This recipe made about 10 cupcakes. Bake the cupcakes for 19 minutes. While the cupcakes are baking, you can start on the frosting. Beat the butter on medium speed until it is pale in color. Add in the powdered sugar and Nutella until everything is fully combined. This does not make a lot of frosting so I would recommend doubling it if you are making more than 10 cupcakes. After the cupcakes have come out, let them cool for about 5-10 minutes. Next, you will need Nutella and a tip, so that you can cut out the middle and fill it. Use the tip and insert it into the middle of the cupcake. You do not want it to go too far down, so go about halfway through. Take out the cake out and fill it with Nutella. Frost the cupcakes and roll them in the crushed hazelnuts if you would like. And ta-da! You have Ferrero Rocher cupcakes. These are super easy and tasty. Remember to tune in on Mondays if you would like to read up on other delicious treats. I absolutely love blueberry muffins. They are one of my favorite treats. However I have never made them before, so today was my first try. I used a recipe from allrecipes.com To check out that recipe click here. First you need to pre-heat the oven to 400° Fahrenheit or 200° Celsius. Then line a muffin tin or grease it. This recipe made 6 Muffins for me. Combine all of the dry ingredients together. 1 1/2 a cup of all purpose flour, 3/4 a cup of sugar, 1/2 a teaspoon of salt, and 2 teaspoons of baking powder. Whisk together. 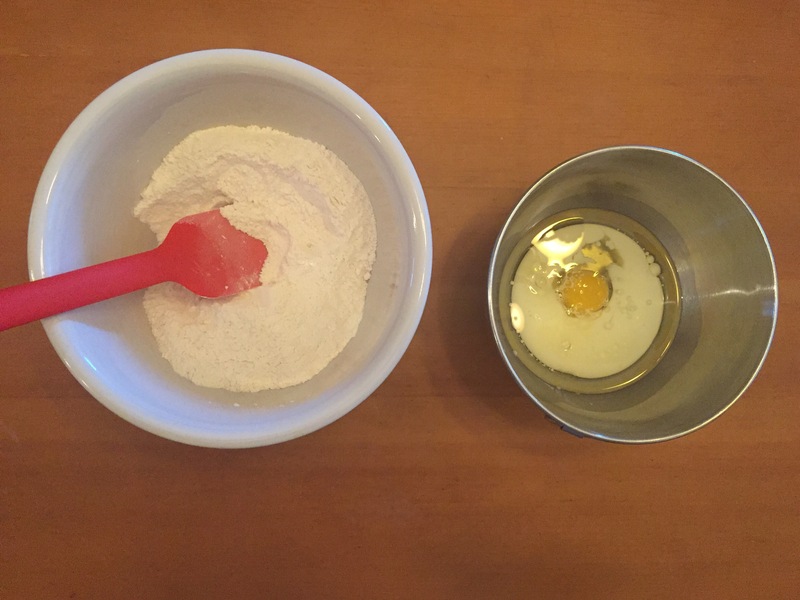 In a separate bowl combine 1 egg, 1/3 a cup of vegetable oil, and 1/3 a cup of milk. Now, pour wet ingredients into the dry. Stir together. If your batter is too thick, as mine was, add a little more milk. Gather as many blueberries as you want. Rinse and then dry. Fold these into the batter. Next fill your Muffin tin all the way to the top (don’t spill over). If you want to make the crumble on top, combine 1/4 a cup of butter, 1/2 a cup of sugar and 1/4 a cup of flour plus 1 1/2 a teaspoon of cinnamon. Sprinkle and pat down the crumble on top. Bake for 20 minutes. And ta-da! I thought they turned out pretty good for my first try! 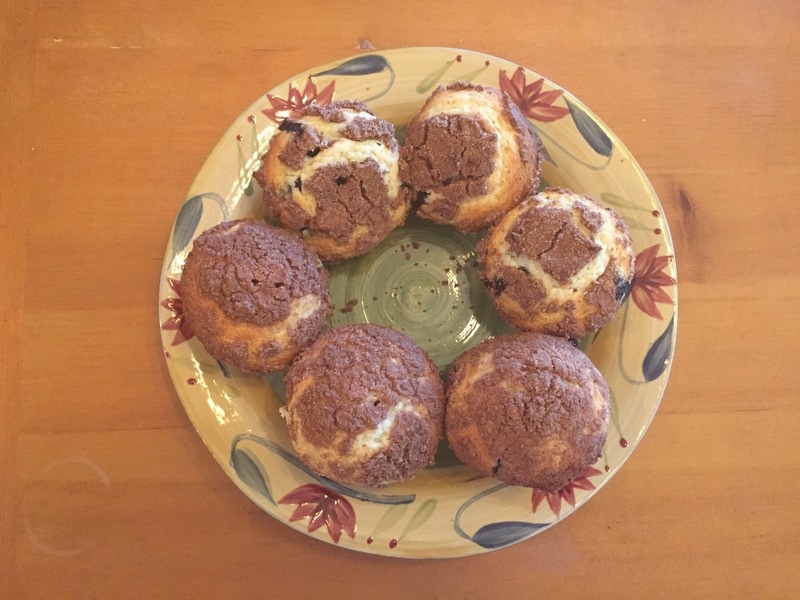 These muffins were pretty easy and turned out fluffy and super yummy!